Gigatent Privacy Shelter Tent is made out of premium water-repellent taffeta 191-D nylon polyester and durable flexible steel. It blocks harmful UV rays and offers an excellent shelter against sunlight or rain. Unlike a traditional tent which needs tools or poles to complete the installation, Gigatent Pop-Up Pod Changing Room Tent does not require poles to set up, simply take it out and it instantly turns into a ready-made tent. Furthermore it is collapsible, so you can effortlessly fold it up and place it inside the carry bag, which is extremely convenient to carry around anywhere you need privacy. Dimension(pop open) : 36" W x 69" H x 36" D.
Dimension(fold flat): 24" x 24" x 3" into the carry case. Use it to get changed in a photo studio or at beach, suitable for both indoors and outdoors. Works great asa roadside toilet anytime in when you cannot find a restroom or when going group camping in a remote area. Use it to take a shower anywhere outdoors especially during camping trips. Can be used as a temporary shelter against unexpected burning sun or heavy rain when you are at beach. An ideal movable and flexible changing room that can be used at a clothing store, which would not only save you more store rent cost but also free up more space to display more various clothes. 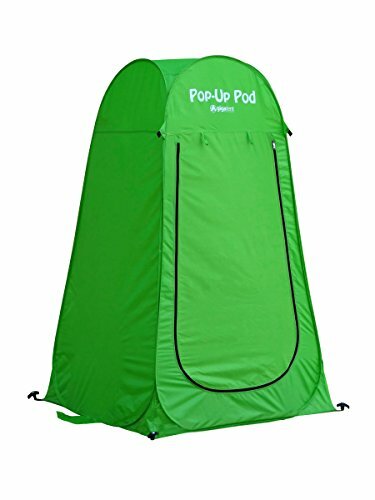 The Pop Up Pod comes with a year money back warranty so you can shop with confidence knowing you are getting a quality product. Folds down into to a convenient 24″ x 24″ x 3″ carry case!